When most of the European countries along with USA are narrowing their doors for immigrants, Australia is one among those countries, which are still welcoming skilled and talented immigrants in huge numbers. Australia has been a key attraction for the skilled workers all across the world. Australia has got clearly defined and organized point based immigration system to allow the skilled migrants in the country. There are various skilled visa categories you can apply in order to work here temporarily or to get PR in Australia. However, you need to score enough Australia skilled migration points to secure your Australian via and immigrate to Australia on temporary or permanent basis. What are Australia skilled migration points? If you wish to live and work in Australia as a skilled worker, you need to apply for appropriate point based skilled visa in Australia. The skilled migration points are the total number of points an applicant scores in Australia’s point-based system, based on his/her age, education, English language proficiency, skills and experience, etc. factors. Usually, an applicant needs to score minimum 60 points to qualify for the online system of application. As per the skilled migration process of Australia, a skilled worker seeking Australian visa needs to apply for any of the sponsored or non-sponsored visas in Australia, i.e. subclass 189, 190, 489, 186, etc. To apply for the skilled visa, an applicant needs to choose an occupation from the SOL (Skilled Occupation List) or CSOL (Consolidated Sponsored Occupation List). A candidate needs to have experience in the selected occupation. After selecting the occupation, apply online for the appropriate skilled visa for Australia and score minimum 60 points (the point score may be required up to 70 for ICT occupations). The higher score will enhance your chances of securing the visa. If you are selected, you will get the invitation to apply for visa. Apply for the visa within 60 days of the receipt of the invitation. 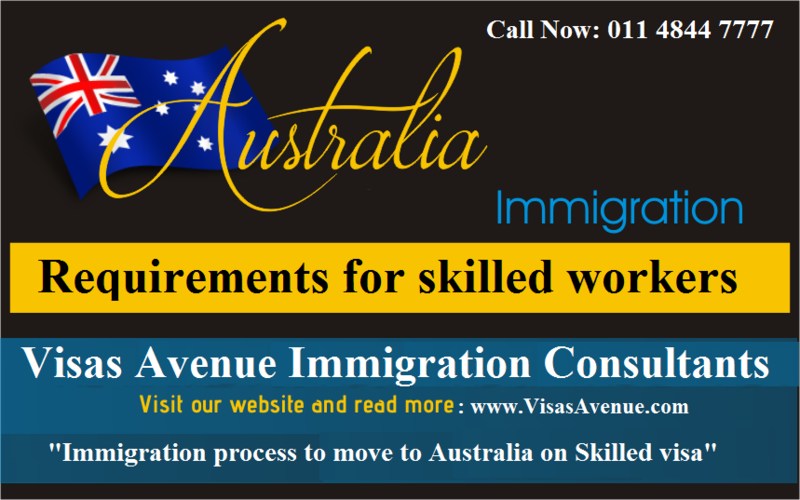 What are the key requirements to apply for the Australian skilled visa? Provide Skill Assessment Report by a recognized authority. Apply in the online system SkillSelect for the desired skilled visa. How to follow the immigration process to move to Australia on the Skilled visa? Australia has got the point-based immigration system. However, you can complete the process accurately if you seek the expert guidance and follow the system stepwise manner. To get the expert guidance, you may contact the certified immigration experts at Visas Avenue Immigration– a top immigration consultancy company in India. Visas Avenue expert will help you to compete for the online process accurately and provide you vital support in visa filing and documentation as well. You may call the experts on 011-48447777 (Delhi) or 080-46668222 (Bangalore) or can mail your queries to info@visasavenue.com.